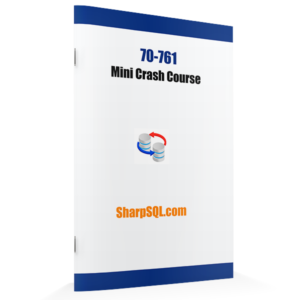 The series will NOT continue as you can download the almost free Ebook “Exam 70-761 Mini Crash Course” here. SQL Server since version 2012/2014 has a new feature OFFSET and FETCH. The OFFSET and FETCH clause provides you an option to fetch only a page or a window of the results from the complete result set. FETCH: Specifies the number of rows to return, after processing the OFFSET clause. 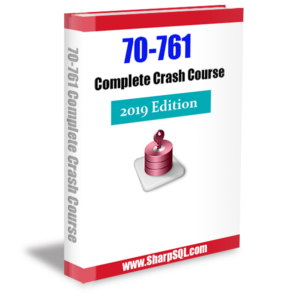 Your database contains a table named Customer that has columns named CustomerID and Name.You want to write a query that retrieves data from the Customer table sorted by Name listing 20 rows at a time. You need to view rows 41 through 60.  A, Wrong syntax “FETCH ROWS BETWEEN 41 AND 60”).  B, Correct Skip first 40 row and fetch next 20 rows that is 41 through 60. SQL Server 2012 introduces new analytical function LEAD() and LAG(). These functions accesses data from a subsequent row (for LEAD) and previous row (for LAG) in the same result set without the use of a self-join. A table named Profits stores the total profit made each year within a territory. The Profits table has columns named Territory, Year, and Profit.You need to create a report that displays the profits made by each territory for each year and its preceding year.  A, Wrong ‘preceding year’ required order by year not Territory.  B, Correct LAG returns previous nth year data, also correct partion by Territory and order by year.  C, Wrong LEAD() display next nth year data.  D,Wrong LEAD() display next nth year data. In simple terms, ranking functions allow you to sequentially number your result set. They are used to provide a rank of one kind or another to a set of rows in a partition. The partition can be the full result set, if there is no partition. Otherwise, the partitioning of the result set is defined using the partition clause of the OVER clause. The order of the ranking within the partition is defined by the order clause of OVER. Order is required even though partition is optional. RANK(): Returns the rank of each row in the result set of partitioned column. DENSE_RANK(): This is same as RANK() function. Only difference is returns rank without gaps. NTILE(): Distributes the rows in an ordered partition into a specified number of groups. It divides the partitioned result set into specified number of groups in an order. ROW_NUMBER(): Returns the serial number of the row order by specified column. You create a table that has the StudentCode, SubjectCode, and Marks columns to record mid- year marks for students. 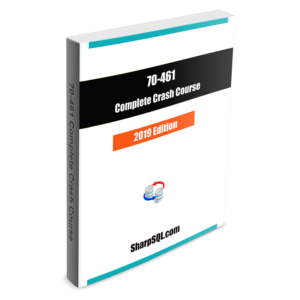 The table has marks obtained by 50 students for various subjects.You need to retrieve the students who scored the highest marks for each subject along with the marks.Which Transact-SQL query should you use?